Construction of out-of-town supermarkets has plummeted in the last two years. Much ink has been spilt on the earthquake going on in the grocery market: consumers moving their weekly shop online and topping up in convenience stores, while also deserting the ‘Big Four’ (Tesco, Asda, Sainbury’s, Morrisons) for German discounters Aldi and Lidl. And it is becoming increasingly clear that one of the major casualties is going to be out-of-town superstores – at the very least new ones, anyway. 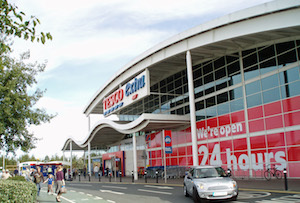 Construction on supermarkets outside of town centres has plunged 35% to 2.2 million square feet since the peak of the ‘space race’ in the middle of 2012, according to new research by property consultancy CBRE. 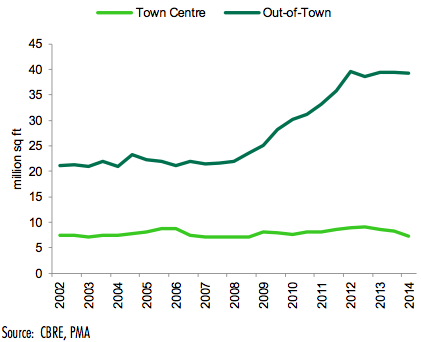 The total amount of new stores under construction has fallen 20% since the end of 2013. Sainsbury’s, though, wrote more than £630m off the value of 40 existing and 40 future stores in its most recent results in November, as new chief exec Mike Coupe admitted a quarter of its stores the wrong size or location. He also said supermarkets would be ‘squeezed’ out-of-town, but disputed claims the superstore is dead as ‘grossly overexaggerated’. 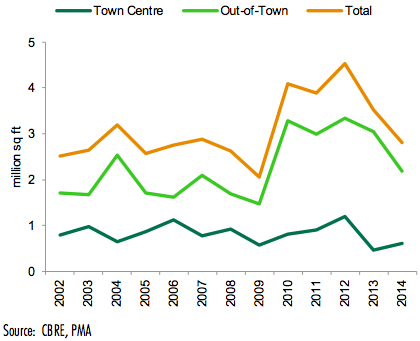 But while the pipeline of out-of-town stores definitely looks to have plateaued rather than plummeted, the trend marks a significant change from the enormous expansion in the midst of the recession. 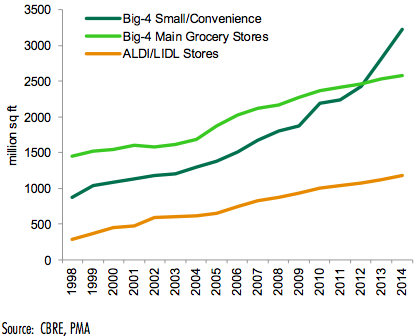 More striking still is the rate at which the Big Four have been opening convenience stores, so far outstripping Lidl and Aldi’s expansion (although that could soon change – Aldi wants to double its stores to 1,000 in the next eight years). A November report by the CBRE posited that supermarkets are actually shooting themselves in the foot, as shoppers spend less overall on convenience stores’ smaller ranges. It looks like the Big Four all have big problems with stores both big and small, then. There is likely to be a sea of red in supermarkets land banks yet.